I took my first class of International Politics in Swedish high school when I was 18 and I have been fascinated by the main questions behind the discipline of IR ever since. Most of my research tries to understand how we can go from conflict to some sort of peace and as such it concentrates on conflict analysis, peace processes and the grey area in between war and peace. During the last few years, I have become interested in gender & security and more precisely gender and the military in different forms. Coincidences have driven my research interests to be concentrated on the African continent, yet what motivates my research is not the geographical places per se, but the drive to increase understanding of peace processes and the different actors involved. 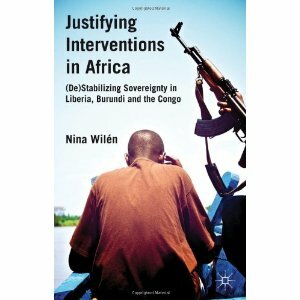 My name is Nina Wilén and I am a Post-doctoral Research Fellow with the Fund for Scientific Research (FNRS) in Belgium and a Visiting Scholar at Lund University as well as the Deputy Editor for the journal International Peacekeeping. Recently I spent one semester as a visiting scholar at the Stellenbosch University in South Africa, where I taught Political Sociology classes as a Guest Lecturer while I was still a post-doctoral research fellow at IOB, University of Antwerp. I was also an invited guest lecturer at Sciences Po in Paris where I taught the Master’s course “Security in Africa” in 2014. I am now a Research Associate both at Stellenbosch University and the University of Antwerp. I finished a 3-year post-doc position with the Royal Military Academy in Brussels at the end of 2013, where I still teach Higher Staff courses from time to time. I am also affiliated at the REPI network at the Université Libre de Bruxelles and working as a Senior Associate at Security Governance Group. My areas of expertise include: peace-building, post-conflict reconstruction and international security but also gender and security, intrastate conflict and armed violence. I’m particularly interested in how military institutions adjust to post-conflict societies, including by contributing troops to other conflict areas, integrating former rebels and opening up the institution to new policies and cultures.